September | 2013 | The Loudest Librarian! This week’s storytime was lively and a lot of fun, even though I was fighting laryngitis, which always makes things a bit interesting. A coworker commented that I sounded like Peter Brady singing “Time to Change.” But the kids hung in there with me anyway. This was an interesting read-aloud. 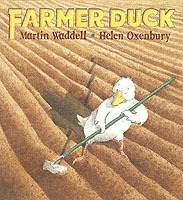 An unfortunate duck is forced to slave away every day while the farmer lies in bed and eats chocolates, until the other animals stage a rebellion and scare the lazy farmer away. It’s basically Animal Farm without all that unpleasant allegorical aftermath, and I was amused to see that a couple of horrified reviewers on Amazon declared it was “dangerous” Communist propaganda. That interpretation would never have occurred to me (and all the other Amazon reviewers loved the book). My storytime kids enjoyed the repeated line, “How Goes the Work?” and getting to yell out, “QUACK!” each time. This one worked really well. 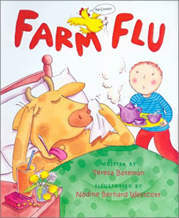 It’s a rhyming book about a boy who is left in charge of his family’s farm when the cow comes down with the flu. He tucks her into bed and coddles her just like his Mom would do, but then all the other animals on the farm mysteriously come down with the flu as well. The kids love chiming in on the sneezes in different animals voices, and the pictures are colorful and hilarious. I wasn’t sure how this one would go over because it was a bit lengthier than the other books, but the kids liked it a lot. Farmer Fred is always very serious, much to the dismay of his animals. They try everything they can think of to make him laugh: Edna the cow stands on the fence and tries to crow like a rooster; the pigs bark like dogs; and all the animals try on Farmer Fred’s clothes and dance around the farm yard. But nothing works, and the animals finally decide to seek out a more humorous place to live. In the course of their escape, they finally manage to make Farmer Fred lighten up, a little, but he still doesn’t think there’s anything funny about corn. This is a funny book that works well for toddlers as well as older kids. 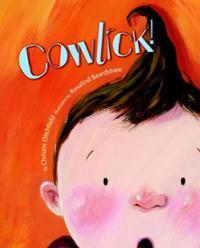 It describes in rhymed verse how a sneaky cow invades a little boy’s bedroom and leaves him with an unexpected gift. Always a hit. Old MacDonald: One of the kids requested that we choose animals in alphabetical order, like we did the previous week. Our farm included an alligator, a baby(! ), a cat, a dog, and an Ella (one of the storytime participants). I Bought Me a Rooster: My CD player broke last week, so I had to play my uke and sing for our instrument play time. This is a fun cumulative song, where the kids suggest animals and the sounds they make. The trick is remembering all the animals in order, as the song gets longer and longer. I adapted this craft from the one on Lines, Dots, and Doodles. 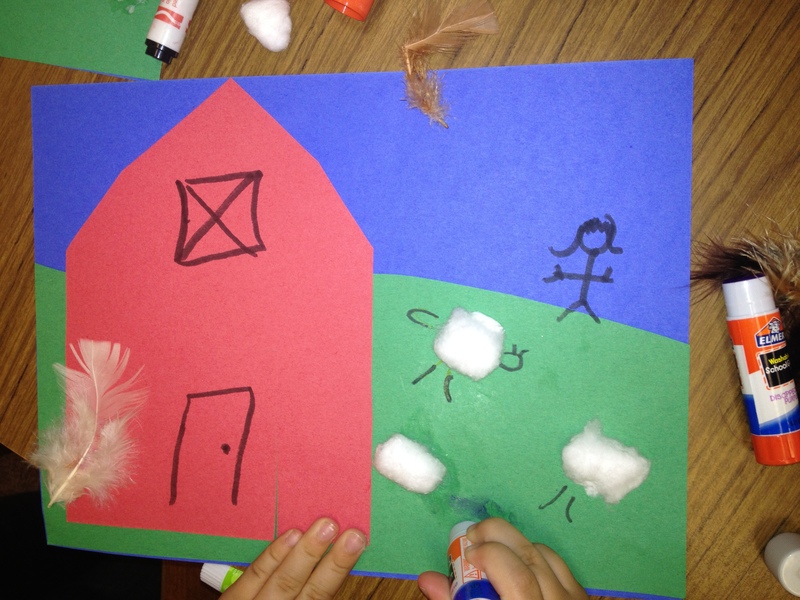 I cut out the barns and grass ahead of time, and gave the kids a choice of adding cotton ball sheep and feather chickens (see Joaquin’s example at the top of the page). 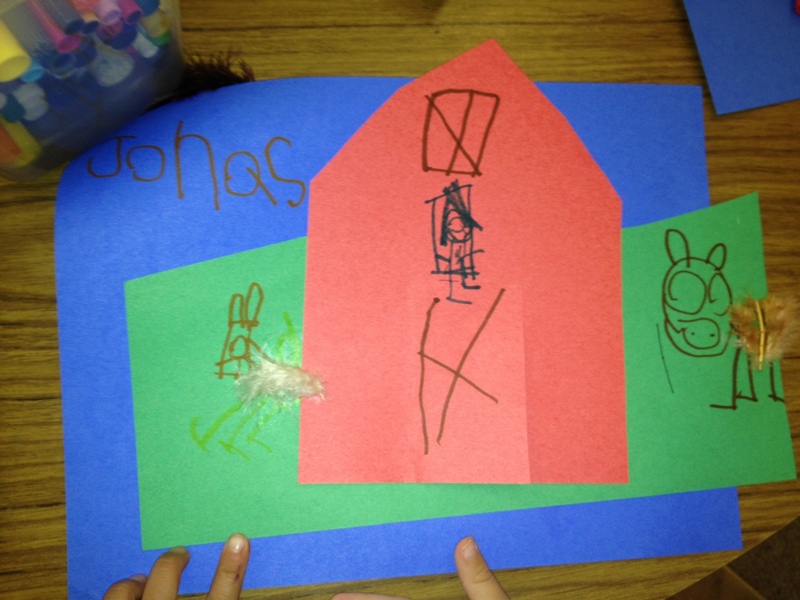 It was cute to see all the different ways they each constructed their farms. You can’t go wrong with David Shannon. When a curious duck decides to test out a little boy’s bicycle, the other farm animals are intrigued. The illustration of all the animals on bikes always gets a big laugh. I’ve always been impressed by Joy Cowley. She’s a New Zealand author who writes literally hundreds of books for the very beginning reader, including many of the Story Box and Sunshine Books (we have these in the library, but they are uncatalogued, so you just have to look for the collection of tiny paperbacks near the Easy Reader section). The beauty of these books is that they have basically the same sentence structure on each page, so kids can easily learn the pattern and read the book, building their confidence and sight word vocabulary at the same time. But somehow Cowley still manages to make these incredibly simple books entertaining, by throwing in a little twist at the end. Mrs. Wishy Washy’s Farm is a more typical picture book, but it’s a cute rhyming story about some farm animals who get fed up with their owner’s constant bathing, and run away to the city. The illustrations are adorable, especially the cow in the washtub. It would also work well for a bathtime theme. I couldn’t do a list of farm books without including the Click Clack Moo series about Farmer Brown and his scheming duck. I think Dooby Dooby Moo is my favorite. The humor in this one appeals to adults (who will understand the labor dispute references), as well as kids. Two friends of mine, Neely Dean and Tanya Scoville, both pointed out a classic I forgot to mention: Big Red Barn by Margaret Wise Brown (author of Goodnight Moon). A joyful, soothing poem about the sights and sounds of a cheerful farm. Kim Day, a children’s librarian at the Burlingame Library, also recommended The Cow That Laid an Egg by Andy Cutbill, illustrated by Russell Ayto, an adorable story about Marjorie, a cow who wishes she had some special talent, and then one day appears to have laid an egg. You can watch the book being read aloud on Youtube here. 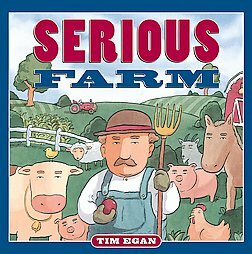 What are your favorite farm books? I’m often struggling to come up with themes for storytime each week (and would love suggestions…hint, hint…), so this week I just decided to be lazy and copy the themes from my daughter’s preschool class. This week she was learning about the alphabet, and therefore, so was I.
Luckily, there are some fun, and funny alphabet picture books out there, many of them new. All of the books I read this week were snatched up immediately and checked out at the end, always a good sign! Number 1 is pleased to introduce this book about numbers until Letter A shows up arguing that it’s really an alphabet story. The argument is complicated by the arrival of 1 Alligator, 2 Bears in 3 Cars…you get the picture. The illustrations are hilarious (the kids all loved the picture of the geese eating hot dogs and ice cream), and there’s a funny twist at the end that calls both their arguments into question. This is probably my favorite alphabet book. It starts out very simply, and it’s fun to have the kids chime in on the opening letters: A is for Apple, B is for Ball, C is for Cat. But then the eager Moose butts in, begging to be featured, and interrupting all the other letters. When Zebra (who is running the show) decides to go with Mouse for M instead, Moose throws an enormous tantrum and starts putting his name (and drawing antlers) on everything. Hilarious! 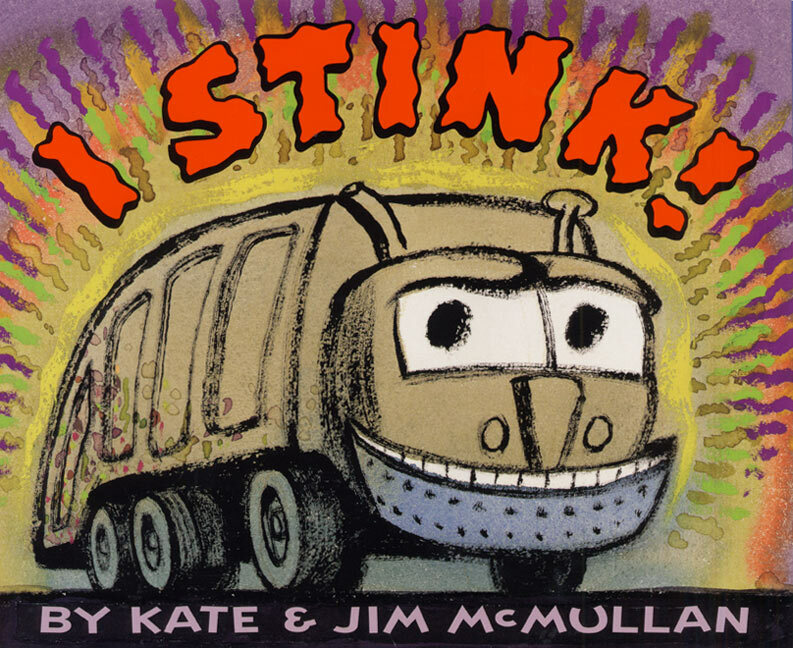 This is terrific read-aloud that works great as both an alphabet book, and a book for kids who love big trucks. This truck is big and tough and eats your trash for breakfast. Burp!! The alphabet part comes in when we find out all the things the truck eats, a list that includes Dirty Diapers, Puppy Poo, and Ugly Underpants. Oh, how the kids loved that part! Ewwww City! 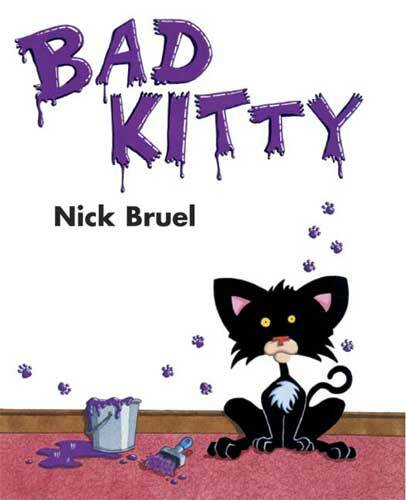 This was my son’s favorite book when he was three, and he has loved every Bad Kitty book since (Bruel now has a series of Bad Kitty chapter books that are hilarious. They are wonderful for second and third graders to read on their own, but with enough illustrations to read aloud to preschoolers. I read them with my daughter when she was three, and she begged to hear them over and over again). This first Bad Kitty book opens with the line, “She wasn’t always a bad kitty,” and goes on to tell about the terrible day when Kitty’s owners ran out of cat food and tried to feed her vegetables. There are four alphabetical lists: first the foods that Kitty hates (Asparagus, Beets, Cauliflower, etc. ); then all the things she does when she turns bad (Ate my homework, Bit Grandma, Clawed the Curtains…); followed by the foods that make Kitty happy (An Assortment of Anchovies, Buffalo Burritos…); and finally, all the things that Kitty does when she turns good again (Apologized to Grandma, Bought me new toys, Cleaned her Cat Box, Drove me to School…). It’s a bit long, but the kids hung in there, mostly because the illustrations and ideas are so funny (my favorite is the cat washing the car with her tongue). This one got snatched up immediately, and other kids were sad I didn’t have extra copies. We also sang Old MacDonald, and I challenged the kids to name animals starting with different letters of the alphabet: Alligator, Bee, Cat, etc. INSTRUMENT PLAY WITH A CD: Man Gave Names to All the Animals by Tim O’Brien, from Sing Along with Putumayo. I’m sure there’s probably a fun alphabet song I could have done, but I didn’t have time to look for one. Any suggestions? I printed the letters from Crayon Action Coloring Pages (I’m always grateful for sites with free coloring pages! 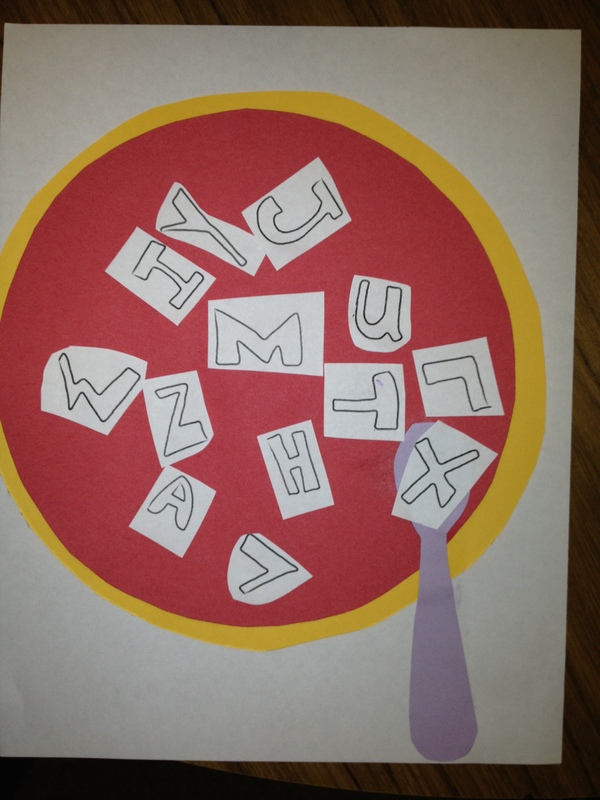 ), then traced out red and yellow circles out of paper, and improvised a paper spoon. The kids glued it all together, using whatever letters they liked. To be honest, it was crazy at the reference desk before storytime, so I didn’t have time to trim the letters as much as I liked. It would have been nice to have plastic spoons to stick on too, and alphabet shaped pasta would have been even more fun. One I meant to do was the classic Chicka, Chicka Boom Boom by Bill Martin Jr., John Archambault and Lois Ehlert. 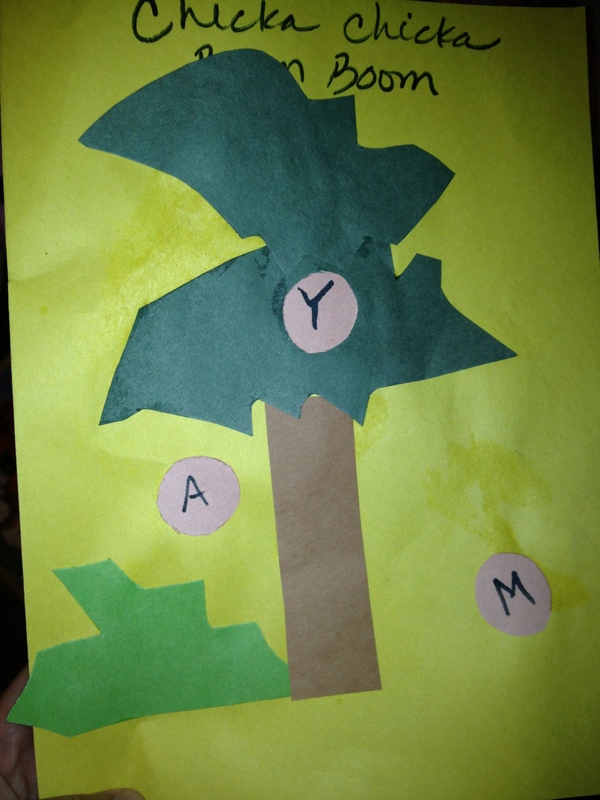 In fact, my daughter did an adorable craft in preschool last week, where the teacher wrote the letters of each child’s name on coconuts, and the kids got to paste them on the tree. Several friends of mine also listed this as their favorite alphabet book, including children’s librarian Barbara Amberg, and Tina Williams, who remembers reading it to her daughter all the time. 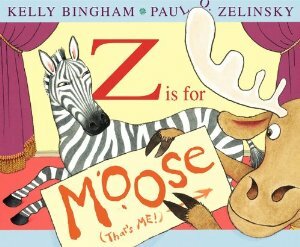 Cute story that works well as a read-aloud for toddlers and preschoolers, even if you don’t mention the alphabet. Max’s Ants escape from the ant farm and Bite Bite Bite, until Max’s sister Ruby finds away to get rid of them. All of the events of the story are in alphabetical order, but Wells manages to make this work without seeming forced. Max and Ruby are always a big hit. Recommended by Kim Day, a children’s librarian in Burlingame, California. Wonderful book for your reptile lover, about a fabulously long snake who comes in handy when two burglars come to call. The alphabet part comes in when Crictor demonstrates the shapes of different letters. The favorite of my friend Neely Dean’s daughter. How can you go wrong with Dr. Seuss? Funny illustrations, wacky ideas (a Camel on the Ceiling), and a catchy rhyme. Plus it shows both the capital and lower case letters, as well as giving multiple sounds for the same letter. Recommended by Michael Lambert, Deputy Director of Library Services for San Mateo County. This is an alphabet and counting book in one, with bright, colorful photographs of both capital and lower case letters next to an object that begins with that letter. I’ve noticed that a lot of alphabet books try to draw the letters in clever or artistic ways that are fun, but aren’t necessarily the best way to introduce them. This one is both appealing to kids, and very clear. The counting side of the book shows how to represent the numbers from 1 to 99 using different groups of coins: perfect for teaching addition or money values. Recommended by Ashley Waring, a children’s librarian in Reading, Massachusetts. I had never seen this one before, but it is oh so cute! It’s bedtime for the lower case letters, but of course none of them want to go to sleep. “Uh oh! a is wide awake. And b still has a bath to take.” The illustrations are goofy and fun. This one was recommended by both Ashley Waring and Kim W., who directs a preschool in Alabama, so I will have to add it to my repertoire! Adorable alphabet peas demonstrate their amazing skills for every letter: “We’re acrobats, artists, and astronauts in space. We’re builders, bathers, and bikers in a race.” Definitely a more exciting take on the usual “A is for Apple” style books. Another favorite of Kim W., and by one of my all-time favorite authors, so I’ll definitely be getting this one too. Every night at bedtime, Charley’s alphabet says their names, just for fun. But one night, little x is missing. The letters must fly on a pencil to look for their friend, and find him in the castle of Master M. To their surprise, they find he is happier there because Charley never used him. But one of the letters knows a secret to bring him home. Wonderful recommendation by Barbara Bruxvoort, a children’s librarian in San Bruno, California. This one works great for car fans and Bay Area locals. Each letter represents something a child might see while out on a drive: an Ambulance, a Bus, a Cement Mixer. Set in San Francisco, it might make for a fun game to take out on the road and see how many of the objects you can find in real life. Recommended by Veronica Meade-Kelley, a science writer who described it as “How I Taught My Kids to Never Leave Home without a Grown Up.” Two children and their pet gazelle run away on an adventure in the sewers in search of treasure. Not for young children, unless they have a high tolerance for creepiness, but great for fans of darker fiction like Roald Dahl or Edward Gorey: E’s for the Evil that lures and Entices, F is for Fear and its many devices. 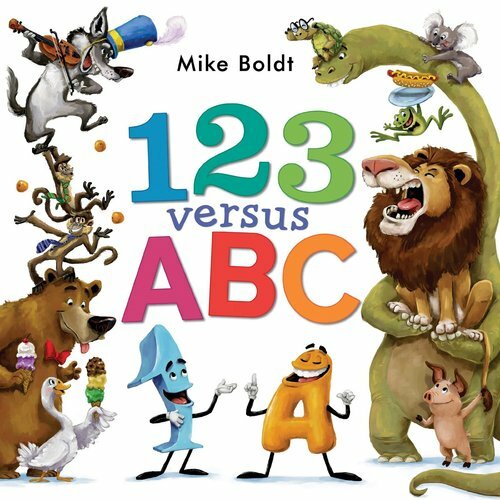 What are your favorite alphabet books? Last night we read books that were loosely related to Fall. I have the same issue with seasonal books that I do with holiday ones. The ones that are purely about the seasons are often pretty dry. Also, I always feel a little funny reading seasonal books in the Bay Area, especially here on the coast. We have spring, summer, autumn and winter several times a week. This morning it was clearly autumn and I had to wear a jacket when I dropped off my son at school, but by 10 it was spring, so I took it off. This afternoon it was definitely summer. For all I know, tomorrow there will be a winter rainstorm. I’ve given up trying to figure it all out. I just try to keep a flexible wardrobe. But we never get snow (a shame, because so many great picture books take place in snow). And only a few embarrassed trees drop their leaves here. The eucalyptus and cypress defiantly keep theirs all year. So the picture book versions of the seasons don’t really apply. 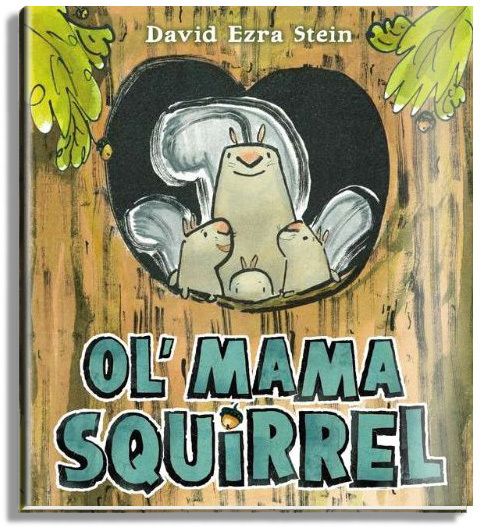 I’ve only discovered David Ezra Stein in the past year or so, but I love his books, especially Interrupting Chicken (such a fun read-aloud!) This one’s about a tough old Mama Squirrel who will scold anyone and anything who threatens her babies, even a great big bully of a bear. The kids enjoyed chiming in on the “Chook! Chook! Chook!” of the Mama Squirrel, and this book was quickly snatched up at the end. 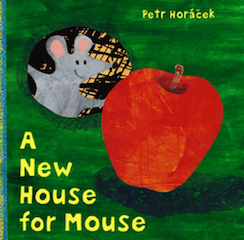 Cute story about a mouse searching for a new home that will hold both him and his apple. As he goes along throughout the day, snacking, and asking different animals if he can share their homes, the apple gets smaller and smaller until he winds up right back at his own hole, which is now a perfect fit. This one has cut-out holes in the pages, which always seem to fascinate kids. They all seemed to enjoy this one, and it got snatched up too. I’ll confess that I had only skimmed this one before story time, and wasn’t planning to read it, but one of the kids grabbed it from the pile and asked if I could read it next. 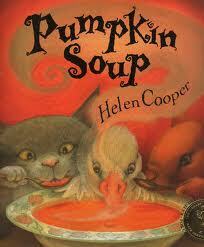 It’s the story of a duck, a cat, and a squirrel who each have a particular job to do to make the pumpkin soup they eat every night. They live together peacefully, until one day the duck decides he would like to try stirring the soup. They all have a tremendous fight, and duck leaves. The kids were all mesmerized, waiting to see if Duck would come back. (I was too, since I wasn’t 100% sure of how it was going to end). But of course, they all learn to be more flexible, and everything is happy again, until the Duck decides he wants to try playing Cat’s bagpipes… This one got checked out at the end too. This was the one book that was clearly related to Fall. It’s a simple story, but sweet, about a young bear who is alarmed to see the leaves falling, and tries to put them back on the trees. The kids were intrigued by the way the bear curls into a leaf-filled hole that is buried by snow in the winter, and how he is hidden there until spring. This one would work well for younger kids too. INSTRUMENT PLAY WITH A CD: I’ve had several requests for Bananaphone by Rhonda Vincent from Sing Along with Putumayo, so that’s the one we did. But a more appropriate one would have been What Falls in the Fall? by Laurie Berkner from her Whaddaya Think of That album. 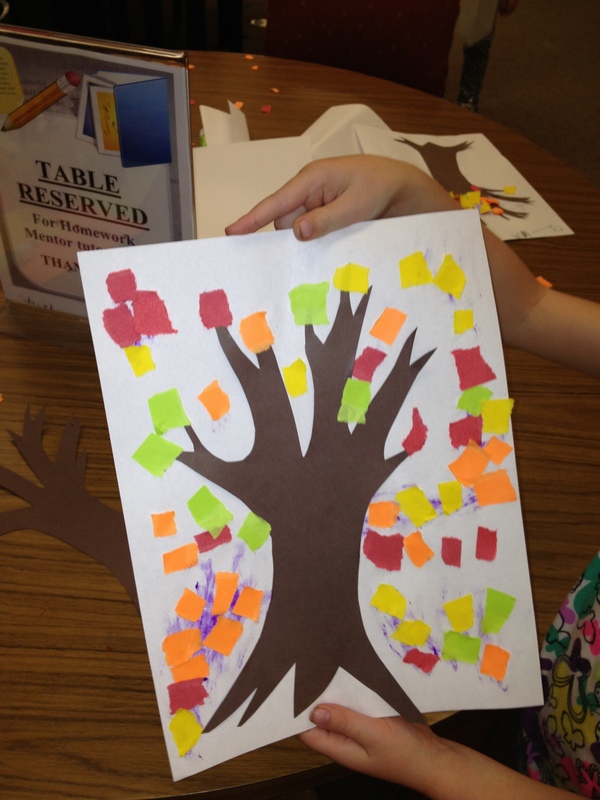 I cut out the trunks freehand from brown paper, then tore bits of colored paper for the leaves. 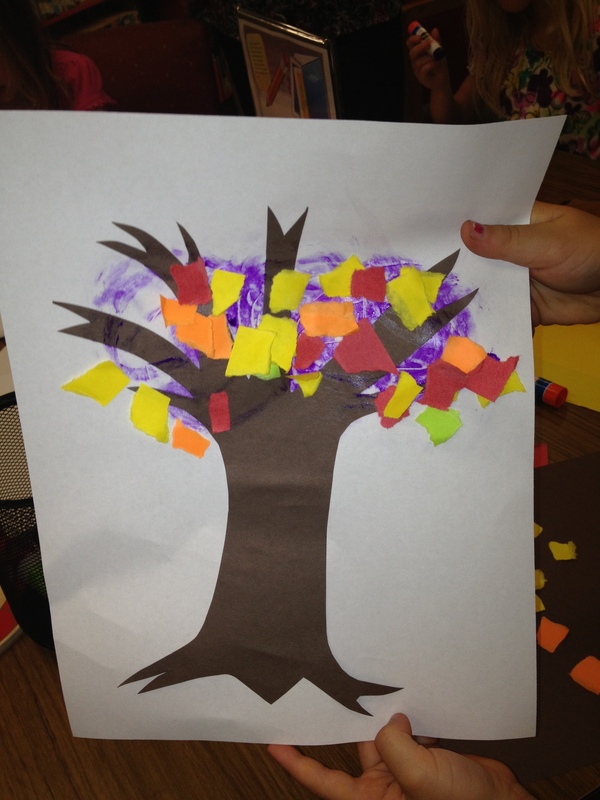 It was fun to see the different ways the kids approached gluing on the leaves. Some scattered them in handfuls, while others applied each leaf individually. If I did this craft again, I might print out the template at the bottom of this post from The Crayon Box Chronicles (she also has a neat way of making tree trunks out of brown paper bags). I just found this site, and I’m already in love with it. LOTS of different kids art ideas and they all look like great fun! Check it out! One book I meant to do, which is one of my favorites for fall, is Leaf Man by Lois Ehlert. In this one Ehlert uses autumn leaves to create a wonderful assortment of animals and scenery. I’ve actually used it several times as a craft idea too, and brought in leaves for the kids to glue together to make their own creations. What are your favorite picture books about Autumn?